His plates tell drivers to hang up, ask why they're texting, and of course, tell them to keep their eyes up! STILLWATER, Minn. -- Mike Boyd was fed up with seeing distracted drivers. "You can't yell at everybody, you can try and people don't really like that," Boyd explained. So he decided to take a different approach to try and stop the problem - without the yelling. 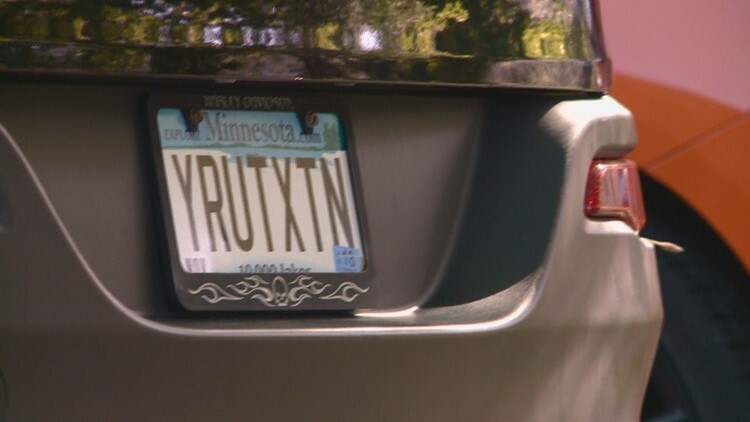 Boyd got custom license plates that push for people to put their phones down, using his vehicle as a moving billboard for distraction-free driving. "People might see them and take the suggestion," he said. His first two sets of plates read "U HNG UP" and "Y R U TXTN." "I got that last year after a friend of mine's 16-year-old niece was killed in an accident by a texting driver," Boyd said. Last but not least, Boyd got a plate inspired by our very own #eyesUP campaign. "I've actually had people come up to me and say because of my plates it has made people think a little bit and has changed the way they carry on and stop texting," he explained. And that is his biggest goal. "It's just to make people more aware that this is just an incredible problem," said Boyd. Take the #eyesUP pledge here. Sign up for the KARE 11 Sunrise newsletter to get the latest news sent to your inbox every morning.